I always knew that underpinnings affect the way a garment looks on the human body, but it was really brought home to me by a dress I made and carefully fitted around three years before I made a set of stays. Once I wore it with stays instead of a modern bra, there were very obvious fit problems in the bodice. A couple of months later I was at the 2010 Jane Austen Festival Australia with my now poorly fitting dresses, and I realised how much I wanted a weekend's wardrobe of Regency clothing. To get that, I first need decent underpinnings, and because I'm an all or nothing perfectionist, that meant solid research about what authentic stays from 1790-1820s were really like. So I decided to find every set of stays that I could, and without travelling from my home in Australia. Thankfully more museums and universities are making their collections viewable in website galleries, and there's much more to be found on their websites than there was even five years ago. I also looked online for private collections, items sold through antique/textile sellers and auction sites and in every book on historical costume that I could find. I wanted to see if there were any common design details in the extant items ("extant" meaning original garments still in existence). There's a family streak of OCD that can be very useful, and I found myself continually expanding my spreadsheet of data as I realised there was something else I wanted to track the use of. I found just over eighty garments dated between 1790 and 1829, and had to decide on a method to assess changes over this period of time. I decided to group the garments by decade, which wasn't as simple as it sounds. I knew that dates of items in museum collections may not be accurate according to today's knowledge. This is because items are catalogued when the museum acquires them, and it would have been based on knowledge at the time. More accurate information is easier to access now, but museum staff may simply not have the time to review the items in their collection. I decided that I would stick with the museum date range (even if I came to disagree with it), and that for those stays with a date range that crossed more than one decade I would include it in the first part or whole decade. It's not a perfect structure, but I needed to be consistent or risk the results being less effective. I also accept that my results are based on garments that have survived the past 180-220 years, which is not necessarily an accurate reflection of what was worn at the time. Over the years I've had many discussions with friends about why garments survive – both vintage and antique. Firstly it depends on people having space to keep things, and the climate for them not to get badly damaged. Perspiration helps fabric degrade (a nicer way of saying "rot"), so in hotter, humid climates stays are more likely to have perished. Some people are hoarders, others quickly discard what they no longer want or use. Even today, the reasons people keep things are quite different, sometimes opposite reasons. A dress may be linked to sad memories, and have been packed away and never looked at again, or it could have been kept because of the happier times it brought to mind. Some items could have been uncomfortable to wear or no longer fit but were thought of as too expensive to discard. Then again it could have been very comfortable and a favourite that, despite heavy use, was still kept. I'll list Acquisition Numbers (also called Accession or Object Numbers), which are the catalogue numbers, as well as provide hyperlinks, as a few museums have changed their website structure and old links become useless quickly. There's a lot of variety in design. From all the collections I reviewed, only The Costume Institute (part of the Metropolitan Museum of Art in New York) has stays that look like pairs of identical or near-identical garments. Stays 1999.216.6 and 1999.216.5 have very similar style lines and decorative motifs. 1999.216.6 looks like it's been altered - the centre front seam doesn't go to the top edge, and 1999.216.5 has lacing over the left breast (on the other stays, only that side of the top edge is gathered). Stays X51.4.1 & X51.4.2 look close to identical, and I love the button down flap to the busk pocket ... I've not seen it anywhere else. CI.38.23.291 and CI.38.23.292 look identical apart from colour. The Museum of Fine Arts have two quite different stays that are listed as both being owned by one woman (Mehetable Stoddard Sumner, 1784-1826); both stays have a date range of 1800-1826. In my search it's the only time I've seen two different styles itemised as being from the same original wearer. The Museum of Fine Arts acquisition numbers are 49.904 and 49.905. The first garment, 49.904, is a fascinating one, with an unusual solid upper back piece with minimal boning or cording. You can see the stitching lines for a busk pocket: it looks fairly narrow hipped compared to the mannequin it's displayed on (look at how the side seams move around towards the front and how the gap at the back gets wider towards the hem). Overall it doesn't look heavily worn. The second garment, 49.905, is a more typical design, looks to have more shaping in the hip and bust and looks well worn. I can't help noticing the piecing on the lower left back - piecing is period! Back to these stays, and this is just my speculation, the first could have been bought when she was younger and kept even after they didn't fit as well because of the happy memories they evoked, and the second are the purchase of an older woman with more curves, and well worn because they were comfortable or useful or a favourite. The date range of 26 years would allow for that. Alternatively, a friend wondered if one was Mehetable's and the other originally her daughter's or mother's that ended up in her possession. The only Regency stays I've seen in real life are tiny, possibly for a teenager, and have lovely floral trapunto work. They've been darned and patched, possibly more than once. The front neckline may have had a drawstring cord across it, but as that edge has been re-bound, you can feel where it becomes less bulky on each side, but only guess why. The mending resulted in stitching part of the way down the busk pocket (on one side of the busk pocket), so after that it would not have been possible to use a busk. These stays were obviously well worn. Was it a hand me down in a family with many daughters? We'll never be sure, but it's fun to guess. Another gap in my data is that the museums don't provide a complete description of every item, and not all of them have a photo either. Some of the online photos are small or a poor quality image (generally much older photos with poor lighting and thus less detail). So accepting that limitations are inevitable, what are the results of my research? The first thing I looked at was the fibre and colour. I didn't do a thorough search of stays from before 1790, and those I came across were in colours from fawn to yellow to red, plain weave to brocade and wool, silk, linen and cotton were the fibres used. I don't recall seeing any paler than fawn, though I had to hold myself back from searching for all the stays I could no matter when they were made. I was a little surprised that those I found across the 1790s were much less diverse. Half were white or close to it (cream or ivory). I did notice that the five coloured items were mainly jumps (very lightly boned, informal alternative to 18th century stays) and were brown, green , pale pink, tan and a yellowish tone. During the 1800s, white shades were even more common (77%) and the coloured ones were in beige, blue and brown. The trend for white continued in the 1810s (75%) and by the 1820s, 86% were white and the only colours I could find were buff and ecru. Thinking about it, it's not such a surprise to me that white came to dominate. White gowns were a huge fashion statement, and one thing you didn't have to worry about with white stays (and all white underpinnings) is show through. Today I have to carefully choose which bra to wear under a couple of blouses as they're slightly sheerer, so it makes sense that at a time when white was such a fashionable colour to mainly have white underwear. White stays wouldn't be an issue under coloured garments, especially when chemises/shifts were also white. I also suspect that is why there isn't much contrast stitching as decoration. The contrast stitchings I could find between 1800-1820 were pale gold, pale yellow and gold. These are low contrast choices of colour, and that lowers the chance of show through. In the 1820s contrast stitching was more mixed, with one pale gold, one blue and one multicoloured. Another is described as 'embroidered' but there's no photo so I've guessed that the stitching is in another colour. What did surprise me is the disappearance of wool as a fibre (only one during the 1790s), and the limited use of silk - only three garments are listed as silk. Linen isn't as commonly used as I would have expected, only eleven out of 83 in the forty years were listed as being made from linen, and five of those were from a date range starting in the 1790s. Cotton really does come to be the most commonly used fibre, far more than I expected. The weave used for the fabric is something that I wish there was a lot more information on, but sadly it doesn't seem to be mentioned much in the online galleries. I'd love for more to become listed in the museum websites. The next things I wanted to know about were the length of the stays, and were all the short ones tabbed or not? I can understand that tabs had a functional use with the previous style of clothing, but did they remain in use or not? It made sense to me also to look at whether they were front or back lacing, and if the shoulders tied at the front or back. As someone who lives alone and rarely has help getting dressed for an event, I'm always looking out for garments that are authentic for a period but will still let me dress myself. Yes, I was happy to see that short stays were a little more likely to be untabbed (ten examples) as tabbed (seven examples), and it wasn't a complete surprise to see long stays quickly become the most common length. However it was a surprise to find there weren't any short stays in the 1810s and only one out of 29 in those dated from the 1820s. I really wasn't expecting for long stays to be quite so dominant, though there is definitely diversity of design within the longer length. Most of the front closing items in the 1790s are jumps, though the early 1800s had more front closing short stays, including a couple with cups inserted (not V gussets, but U shaped inserts). There is a little more variety at that time with stays that close at the front. The brown silk taffeta stays in the Camilla's Italian collection are not only front lacing but also have 'elastic' casings under the bust. Not elastic in the sense of the rubber elastic we know today, because natural rubber is sticky, inelastic and easily deformed. Commercially vulcanised rubber was invented in 1839 or later. The 'elastic' channels in these stays were made by small wire springs either sewn into casings or encased in fabric tubes and then attached at each end. There is another pair in The Costume Institute that is front lacing with channels for springs under the bust. (I'll come back to these later on). The long stays that close at the front (there are some, but not many) don't appear to be designed to provide structural support, or at least not structural support with bust direction. I'm thinking of the stays The Costume Institute, number 2006.545. They may fit closely between under-bust & hem, but the upper section would provide more of a shelf-bra effect rather than positioning the breasts in any specific shape or direction. As a side point, these are one of the very few, if not the only pair I found that has a clear under-bust seam. As for the strong preference for long stays to be back lacing, it's an easy link between the use of a front busk and needing to be laced up the back, though I have played with the idea of spiral lacing around a busk pocket. I am intrigued by the wraparound stays, as I think of them as easier to put on. The Kyoto Costume Institute two piece brassiere is a wonderful example of experimental stays. I have already tried making a copy of them for myself and I don't think they work for a very heavy bust and narrow shoulder. For most people I can see that a properly fitted pair may work, though they don't give the lift & separated look that stays with a front busk provide. 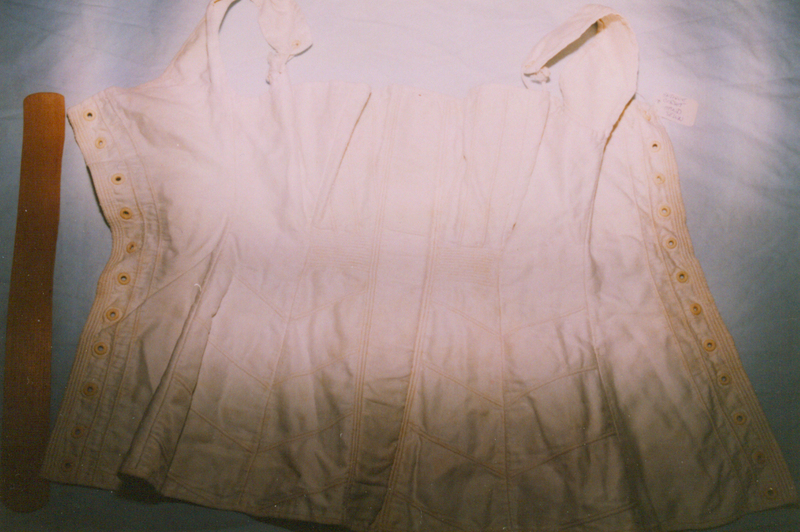 Overall, wrap styles seem to be divided between those that seem designed for modesty rather than for support, such as Vintage Textile's item 2319 (1810-20), and those that do provide support, for example the corset blanc at the Musée de la Mode Galliera (1820s) and the 1820s Victoria & Albert Museum bust bodice T.341-1978. The V&A bust bodice has me very intrigued as the seam lines remind me of those on shifts and I'm very tempted to try to copy them for myself. In the 1810s more than 66% of shoulder straps were seamed both front & back, up from 31% in the 1800s. In the 1820s shoulder straps tying at the front start to trend again (up by 5% to 17%), a trend that continues in the 1830s (by then 28%), and I was a little baffled why that would be. I mentioned it to one of my costume buddies who asked a simple question: "Aren't the shoulders on dresses getting wider?" Then it's obvious, that depending on the dress, you might want to loosen the shoulder straps rather than have them fixed in place. The next thing I looked at was how the bodice was shaped. Were cups (U shaped) or gussets (V shaped) inserted and how many, or was there a vertical panel seam? I hesitate to call it a 'princess seam', so I'll stick with the phrase 'vertical panel seam'. Only four out of 83 in this time period have U shape cups, and there's at least two earlier stays that have this feature. The Costume Institute have brown 18th century stays dated 18th c, C.I.41.94 that have been designed with a cup on each side. I didn't include them in my survey as they aren't clearly dated in the 1790s. The Kyoto Costume Institute also have front lacing stays (with stomacher) dated 1785 (AC5080 85-9-4) that aren't in their online gallery but are pictured in the different editions of "Fashion History". They appear to have been 'modernised' from an earlier style by adding a cup inserted into each half of the front. To me it doesn't look particularly comfortable, or successful. Where the cup is placed on each side surely the woman would have ended up with eastie-westies (where the breasts don't both point forwards but one to each side). Now I've seen fashion plates (right) where this looks exactly like what's happening. It's possible the artist didn't have the technical skills, or did enough women have this look that the drawing was based on reality? It's true that some women are naturally eastie-westie, but these stays make me think that others may have had their underwear provide that direction for them. A c.1790 pair in the Victoria & Albert Museum T.237-1983 has cups, as does the c.1805 pair from the collection of the Connecticut Historic Society Object number 1963.42.4. These front lacing stays have previously been exhibited at Kent State University and the Past Patterns #38 transitional stays pattern is based on them. Another pair dated 1805-1810 is the silk stays with cup & 'elastic' under-bust area from the Costume Institute C.I.46.82.8. This pair looks to have a larger cup area, and the higher back would also provide structural support. The Costume Institute has a couple of examples of panel seamed stays. The stays of Mehetable Stoddard Sumner 49.905 have a definite curve to the seam over the bust, much more than 1970.106.5 of the 1810s-1820s. Other examples of panel seamed stays include Augusta Auctions Lot 578, which has a very pretty geometric cording pattern, and Vintage Textiles has previously sold some that were functional rather than decorative (#1886 is no longer on their website). Based on the information available, from 1800 to 1829 there's a slightly higher use of gussets compared to vertical panel seams, though this is another area in which there isn't quite enough information to be really confident. It could move either way in both the 1800s and 1820s if we could see clear photos of all the stays. Double gussets are more consistently used than single ones from the 1800s on. Examples of single gussets include Karen Augusta's Lot 192 (albeit a large gusset), and the c1800 stays from the Ohio Historical Society that have a single gusset between the panel seams. When looking at the photos of the OHS stays I noticed that the website has photos of two different garments listed as the same one. One pair have shoulder straps that tie at the front, and the other pair's shoulder strap is seamed front and back. Examples with double gussets include the Costume Institute's 2009.300.3229 and the University of Alberta's c1805 1974.9.9. The bust padding pocket in the c1811 stays in the Missouri Historical Society collection caught my attention. These aren't the only stays with bust padding, as the Manchester City Galleries have stays dated 1790-1810 (1947.1625) with bust padding in the description but no online photo. The last feature I reviewed was boning and cording in garments. Was it used, where it was used and what effect did I think it was there for? The newer styles of stays didn't rely on being heavily boned, and I suspect that the pair listed in the 1800s as being heavily boned (no photo available) may have been made for someone resistant to the new style of dress. From the 1800s on, if any boning is mentioned it's very light, used in one or two places at most. In the Missouri Historical Society's c1811 pair, not only does a bone run down the front of the bust, which would provide support, but one also goes from the underarm to the waist. The majority, however, have no mention of boning in their description. As I expected, cording starts being used as boning is used less. Some cording at the bust appears to add volume rather than support. For example, to my eyes the heavy cording on the bust area only in The Costume Institute stays 1982.82.3 would provide some lift if it was needed, but would also pad out the area. The stays in the Manchester City galleries 1948.250 have quite a bit of cording on the torso but not on the bust cups themselves. So do the Victoria & Albert stays T.57-1948. The Museum of Fine Arts stays 44.348 have cording on the gussets themselves, and like the mid 1830s stays on AbitiAntichi, have rows of cording replacing the busk at the upper & lower edge of the busk pocket. My theory is that if the breast tissue is close together the busk may not fit all the way to the top edge, and the rows of cording would keep the fabric firm so that it didn't flop down. Both these stays seem to have plenty of volume in the bust area. I have another pet theory that the cording below the bust provides structural support similar to that which a bra band does now. It acts as a firm, stable resistance to the effect of gravity. I think the MFA stays I just mentioned and another set from the MFA 99.664.34 are good visual examples - they're placed on a mannequin so it's easier to see than when they're photographed flat. When I first thought about Regency or Directoire fashion, it occurred to me that not everyone would have abandoned underwear to adopt the latest high fashion inspired by Greek and Roman statues. Younger, perkier figures would be happy to, but older women used to wearing support garments might more readily adopt jumps styles rather than completely give up foundation garments. Those more in need of support would have been even less inclined to give up all support. There are underpinnings from beginning to end of this time period, so it's reasonable to assume that not everyone completely abandoned stays, although wearing them may not have been the height of fashion early in the change to the new fashion. Doing this abstract research helped me think more clearly about what my choices are for my own garments. Is my personal style experimental and fashion forward, or am I more conservative in my approach? I'm fairly conservative in what I wear for work, and only slightly less conservative for my casual clothing. My costume and re-enactment choices of clothing are much less conservative, since that's where I'm happy to show I'm less conformist and be a little extrovert. I may have already admitted to having a perfectionist streak, so it wasn't enough for me to simply research facts. Looking at pictures and even scale patterns didn't completely show how the stays worked as clothing. I also wanted to make a sample of different stays to see how they worked in three dimensions. I was tempted to make them all fit me, and realised that insanity lay that way for me. I'd want them to perfectly fit me the first time rather than see focus on how they were shaped & were structured for the original wearer. Making the two piece set based on those in the Kyoto Costume Institute, and having them not work for me, made me accept that this was an unreasonable start to a project. I'd be better off making a few in the original size and comparable fabric and then assessing whether they would work for me or not. are actually 1830's according to their website. Great analysis! The only trouble is that, as you mentioned, the museum dates aren't always correct - while I generally trust 1810-1820 dates, I'm not so sure that a lot of the ones that are dated earlier are correct. Thank you for all those links to specific stays, though! Especially the so-called Kent State short stays: I hadn't been able to find a picture since the one on the KSU site was taken down. The OHS date of 1830s isn't necessarily right either. I'm not saying it's earlier than that but there aren't clear enough photos to be 100% certain. One thing I've learned from looking at all the ones I could find is that museum dating isn't always accurate. The Philadelphia museum has stays dated 1810-1830, and personally I'm convinced they're no earlier than 1830 due to the depth of the gussets. This overview is fantastic! Thank you very much! Thank you so much for this article, so many links and photos, so much good thought put into it! I really appreciate it. Any thoughts/ideas on stays using cording in place of a busk? I'm working on just such a pair, but I'm having trouble getting the part of the cording that sits directly between the breasts to lie flat against the sternum instead of flopping forward.